Ferguson Brewing Company is one of the many local breweries in the St. Louis Brewers Guild that we’re pretty big supporters of – both their beers and their rad employees! Yesterday we were contacted by the manager at FBC – he and the employees want to help out The Waiting Room Bar & Venue‘s canned food drive. If you remember a while ago we put on a fundraiser for FBC after their fire, and they want to “pay it forward” by helping us with our annual canned food drive for the St. Louis Area Foodbank. We are excited that FBC saw our posts on the facebooks and wanted to join up with us and increase the amount of awareness out there for our food drive and bring in more cans! So this Thursday the 17th, FBC will be here with beer samples and a bunch of schwag for everyone who donates to the food drive! Want some of the Ferguson Brewery goodies? Gotta bring your cans – or hey, if you’re not into canned goods check out the 35 most needed items at the STLAFB. And if that wasn’t enough, you’ll get that extra stamp on your Beer League at The Waiting Room card. And all that is before we even get to the League Beer this week – Heavy Riff Brown Ale from Excel Brewing Company. Clocking in at a solid 6.5%, this is a limited run of 100 kegs – we’re sitting on #58 of 100! There will be an entirely awesome separate post (and sign up for the email!) tomorrow with some good bits about this weeks beer. The Captaineers are calling the breweries to get more info for you – it’s THAT NEW! See you on Thursday, with cans in your hands! 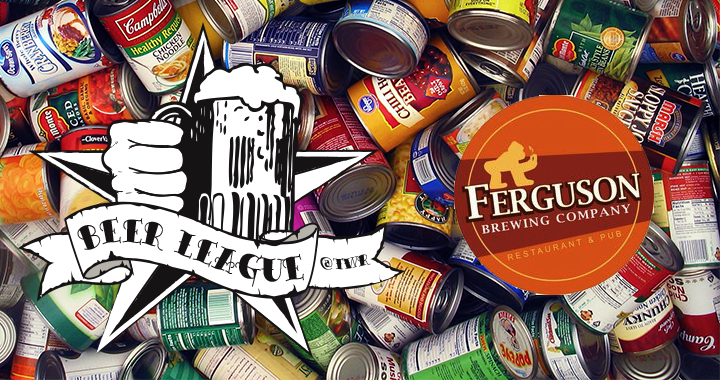 Posted in Beer League, Benefits and tagged beer, canned food drive, FBC, Ferguson Brewing Company, SLBG, St. Louis Area Food Bank, St. Louis Brewers Guild.